Addiction is a monster, and recovering from addiction is a feat that cannot be overstated. Recovery requires a ton of work and everyone’s process is different. The journey may be different for everyone, but the stops seem to be the same. Recovery requires self-realization, accountability, determination, support, and an active effort in maintaining a sober life. In order to reach sobriety and maintain it, many recovering addicts utilize different types of exercise in order to focus their body and mind on a healthy lifestyle. For some, they take the road to recovery by bike. A strong support system is so important in addiction recovery, and for those that embrace cycling in their addiction recovery have also inadvertently gained an incredible community. The cycling community is full of outdoorsy and adventurous people that are incredibly supportive. 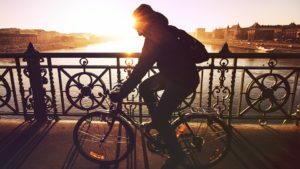 Whether you are biking after work around your neighborhood or taking part in competitive cycling, there is a community available to help recovering addicts feel accepted. In entering cycling races, attending cycling events, or discussing the best trails and runs with other people, it’s a great way for those in recovery to reach out to a new and friendly community eager to welcome in a new member. Cycling is great to help people in addiction recovery because it’s a healthy activity to take part in. Taking part in an activity like cycling promotes a healthy lifestyle that coincides with a sober lifestyle. One of the most difficult aspects to addiction recovery is learning to live a completely different lifestyle without drugs or alcohol, and one of the best ways to make the transition is to stay focused on your health. Staying active and eating healthy are great aspects to focus on that will help make the decision to abstain from drugs and alcohol easier. Alcohol dependence is an uphill battle, and focusing on a healthy activity will help aid in successful sobriety. Similarly, drug addiction is an issue an addict will always battle whether using or not and being focused on a healthy lifestyle is just another tool to help the process. Exercise is a great aid in addiction recovery due to its ability to increase endorphins which can elevate mood, and aid in recovery due to a similar rush that they are used to. The cycle of addiction is a never ending battle for those that have been in the grips of substance abuse, and it’s important to understand that cycle. It’s important to stay on your toes and be ready to battle with addiction no matter how long into recovery you are. Relapse prevention techniques are utilized because recovery is an ongoing process that requires aftercare. Riding is a great way to break the cycle of addiction and relapse because it provides an outlet necessary to keep your mind and body away from the need for substances. Cycling requires so much of your body and provides so much for your mind. Being outside, focusing on your health, and riding a bike in any capacity will aid in breaking the unhealthy cycle of addiction. Cycling to break the cycle of recovery is a reality for many addicts utilizing this activity to keep their mindset in a healthy place. Riding for recovery is a reality in many cities that offer races to connect a love of cycling with a commitment to recovery. One of those cities is San Diego and their race, The Recovery Ride, focuses on recovery from alcohol and drugs and HIV/AIDS prevention and treatment in their community. Their ride offers three different options including a 12, 25, and 40 mile route and the registration fees go towards their fundraising goals for their cause, bringing out a giant portion of cyclers from casual riders to serious cyclers. San Diego isn’t the only city that offers similar events that focus both on addiction recovery and cycling. But an event focusing on cycling is a great way to get into the community in your city while supporting your own sobriety, even if the event isn’t designed for recovery. Many addiction treatment programs focus on different types of treatment in order to reach a broader spectrum of patients. This includes yoga, horseback riding, meditation, or bike riding. Cycling is a great activity that not only helps during the treatment process, but can also be used throughout recovery at home. Cycling is just a fun hobby that offers a community of great people, a healthy activity, and a mindset that battles the cycle of relapse. For some cycling is just another activity, and for some they ride to maintain addiction recovery.